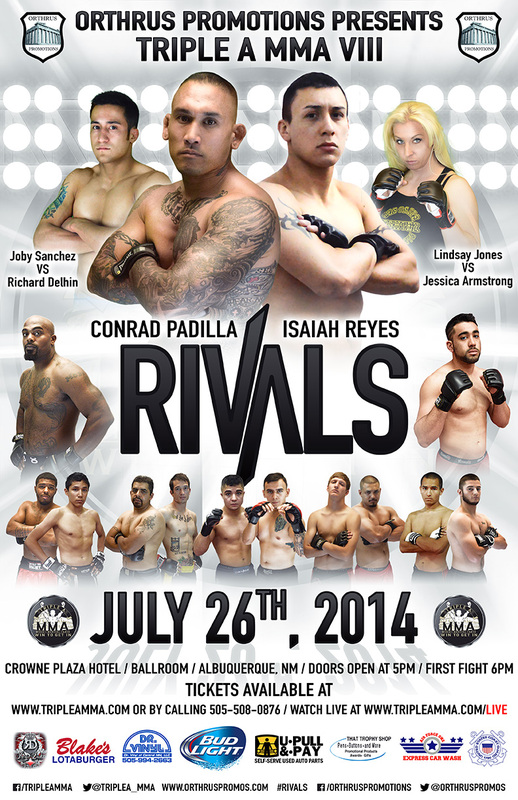 On July 26th FIT NHB’s Isaiah Reyes (7-3) will be headlining Triple A MMA’s: Rivals card at the Crowne Plaza Hotel in Albuquerque, New Mexico when he takes on Jackson’s-Winkeljohn’s fighter Conrad Padilla (4-1). A former basketball player and graduate of Belen High School, Reyes, would transition to mixed martial arts following in the footsteps of his brother to the sport. The physicality he admits is a different ballgame. Originally training out of his home gym his journey brought him to FIT NHB where he says both professional and amateurs have made him the fighter he is today. Tickets to “Rivals” start at $25 for general admission, and $35, $45 and $60 for reserved seating. Tickets can be purchased on HoldMyTicket.com by clicking here or by calling 505-508-0876. Reyes recently joined us to discuss his upcoming featherweight bout against a tough Conrad Padilla. Jorge Hernandez is chief editor for SWFight.com, TV-Host of Combat Sports Weekly and Co-Host of Low Blow Radio. He can be reached on Twitter @JorgeDeBurque.